Wolfenstein II: The New Colossus’ trio of DLC, The Freedom Chronicles, came to a close last night. The third episode’s generic title, “The Deeds of Captain Wilkins,” is apt. This short DLC is forgettable and uninteresting. Each episode of The Freedom Chronicles revolves around the abilities granted by the main game’s three contraptions: the wall-breaking Ram Shackles, the Constrictor Harness that lets you squeeze into small spaces, and the Battle Walker stilts. Wilkins finds the stilts in an early cutscene, during which he returns from 20 years out of the fight to stop a Nazi plot called Operation Black Sun. He reunites with an old comrade, as well as a mysterious woman whose secret is telegraphed so strongly that I barely registered the actual reveal later in the DLC. In the main game, the stilts provided creative opportunities to get the drop on enemies. They don’t add much to “Deeds.” I regularly forgot I even had them as I ran around the DLC’s three same-y, cluttered areas, blasting the usual array of enemies. It was much more expedient to hide behind crates or take pot shots out of vents than to use the stilts’ height. Occasionally they’re necessary to navigate the environment, but they didn’t makee much of a difference in combat. That combat mostly involves large amounts of enemies filling small spaces. Wolfenstein’s combat is mobile and fun, and while “Deeds” doesn’t need to bring anything new to the table, I couldn’t help but want something a bit more dramatic to close out the DLC. You get to fire a big gun at one point, but it’s brief and underwhelming. The areas blended into one another (admittedly a problem with the main game as well), though one featured a moving train car that mixed things up and challenged my spatial awareness. 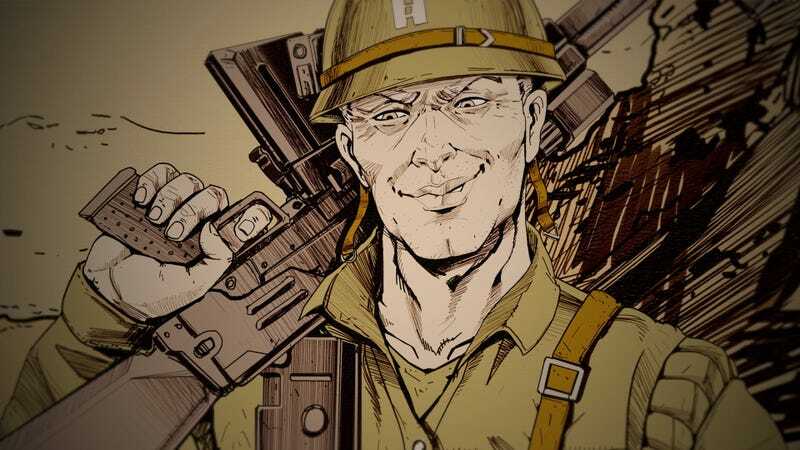 Wolfenstein’s DLC has suffered from the absence of BJ and pals, instead casting you in the shoes of standalone characters you don’t get much of a chance to know. Wilkins is this flaw taken to extremes: he’s a generic gung-ho soldier, spitting lines out of WWII movies about old dogs and cheeseburgers. The DLC has trafficked in tropes and comic book-esque over-the-top characters, but Wilkins doesn’t rise to this level. He’s hard to care about, so the several predictable plot twists fail to resonate. “The Deeds of Captain Wilkins” takes under two hours to play through, and if you already have the season pass there’s no reason not to check it out. Wolfenstein II’s combat is fun, and it’s nice to have more of it. But it’s a shame to see The Freedom Chronicles end on such a dull note.